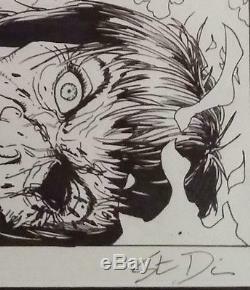 Steve Dillon Signed Original Art Punisher Fire Death of Ma Gnucci in Custom Frame and Matted. Note I had to scan this and not use a photo because of the glare and the frame and the matt got cut off on the scan and I can assure you that the matt is not lopsided and is properly centered and spaced equally! I got this from an Original Comic Art dealer a few years ago. Off the top I don't remember which Punisher issue it was from other than its the one where Ma Gnucci dies in a fire explosion. It is in fantastic condition. 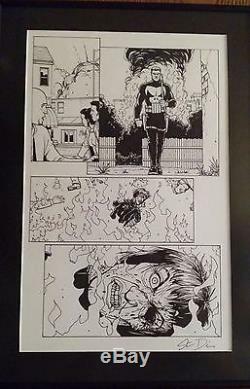 The item "Steve Dillon Signed Original Comic Art Punisher Ma Gnucci Fire Death of Marvel" is in sale since Wednesday, May 03, 2017. This item is in the category "Collectibles\Comics\Original Comic Art\Interior Pages". The seller is "sonofbruno" and is located in California. This item can be shipped worldwide.